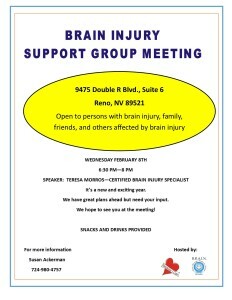 I would,love to join a caretaker support group for the brain injured. I have been standing by my son, Dustin’s, side for,the past 19,years. He had a juvenile pilocytic brain tumor hemorrhage when he was away at college at 19. We both attended a few meetings somewhere near double diamond road, about 15 or 16 years ago but because we lived in Truckee, it was difficult to,get to them on the evenings. I am at the point thT I need support in order to be supportive. I just retired so that I can focus on his future (without me eventually). If you have any suggestions, I am eager to hear them.